An irregular incident can occur any time, any place. Those closest to law enforcement know this best of all. As those on the beat will tell you, wearing a badge is no protection against a sudden and senseless attack from a rampaging repliroid. Hundreds of Irregular Hunters fall in the line of duty each year, struck down by the violence they’ve dedicated their lives to defending civilization against. Some of these irregular crimes continue to go unsolved. This is but one of those stories. If you have any additional information on these events, the authorities urge you to come forward. You may just be the one to provide the missing clue needed to close the case. The following contains graphic images that some may find disturbing. EXTRA EDITION! AN EXCLUSIVE SCOOP! We’ve obtained classified documents from Irregular Hunter HQ pertaining to a top secret investigation!! These classified documents were leaked to us from Irregular Hunter Headquarters through a secure source. A portion of the materials from the Directive File is shown below, outlining the criminal investigation of an irregular who has yet to be identified! If you have any new information regarding this case, please contact this publication immediately!! LOCATE THE UNIDENTIFIED IRREGULAR SUSPECT! ORDER DETAILS: TO INITIATE A TOP SECRET MANHUNT TO FIND THE IRREGULAR CRIMINAL RESPONSIBLE FOR THE RECENT “IRREGULAR HUNTER MASSACRE INCIDENT” AT THE SPACE PORT. On 21XX/X/X, an incident occurred at the spaceport where six Irregular Hunters were slaughtered after running preparation diagnostics on a compact-sized space faring shuttle craft. The victims all shared similar brutal lacerations across their entire bodies. Based on examinations of these wounds, it is believed that the perpetrator must have utilized a high-intensity blade-like beam weapon. Additionally, there appear to be no signs of struggle from the victims, leading investigators to conclude they must have been destroyed instantly. This criminal is perceived to be highly dangerous, and all units are warned to proceed with extreme caution. This reflected image to (shown left) was taken from a video camera, and is currently the only known photograph of the suspected irregular criminal. The investigation has determined that this body type does not resemble any known repliroid design, and moreover there exists no account of its manufacture on record. Therefore it is highly likely that this repliroid is a custom job that was privately constructed by an unknown party. Zero: I am Zero. Some say I’m known for using overly flashy and excessive force. Zero: That’s why in X4, I’m not going to rely my buster any more. I’ll just be using my sabre this time. X: You look like you’re having fun…. Hey everyone, X4 sure is going to be a lot of fun, isn’t it! I’m also having a great time with it. I was born in 1972 in Tokyo, and am also currently a Tokyo resident. While attending senior high I got a job making margin art for video game guide books. After getting my feet wet in the gaming industry, I made my debut as a manga artist for Comic Bonbon in 1993. That debut work was “It’s Rockman! Great Gathering” and was followed by 1995’s “Rockman Remix”. Ever since then the focus of my manga has continued to have Rockman at the core (although I’ve done some other things, too). My latest work “Rockman Maniax” is currently running in Comic Bonbon magazine. My volume of work also includes “Rockman Remix”, “Rockman Megamix”, etc. I plan to continue working hard to churn out more manga! So please continue to support me!! I also really like Dr. Doppler from “X3”. The soldier. He’s pretty striking. He seems like a brash fellow. The male-dominated “X” series finally gets its first female character. Can you believe it…? “X”‘s fated rival (will he be back someday?) there’s no forgetting about VAVA! You may have already guessed, this was the companion page to the CFC’s X4 special discussed in that one article. So, did you guys solve the case already? If not, go pick up and play some Mega Man X4. Or just do a net search. Probably wouldn’t take you a minute. But still, I won’t be spoiling it for you! I was having fun with the serious true-crime drama theme, but then Ariga had to go and lighten things up! Even though he had been popularly renown as a Rockman manga-ka for over 3 years in Japan by the time he drew these, this is still what the Hitoshi Ariga of today calls his early period. Not to say that’s bad, of course! I (and I’m sure many others) have fond memories of the less refined, sketchier style of his older works. But Ariga is something of a perfectionist who likes to touch up his works every time they get re-published, so it’s actually rather cool to compare his older volumes with the newer ones and see what things he changed over time. I imagine he’d probably change a lot about these… but I like them the way they are. That’s also my favorite explanation as to why Zero doesn’t use his buster in X4. Taking old Obi-Wan’s speech about lightsabers to heart, he adopts a more skillful and elegant weapon that that clumsy and random buster. Because what’s more civilized than slicing up your opponents, and watching their flayed entrails spray out at close range? Mystery space port assassins agree, good manners are important. So remember the three D’s kids: division, dissection, and dismemberment. Now then! 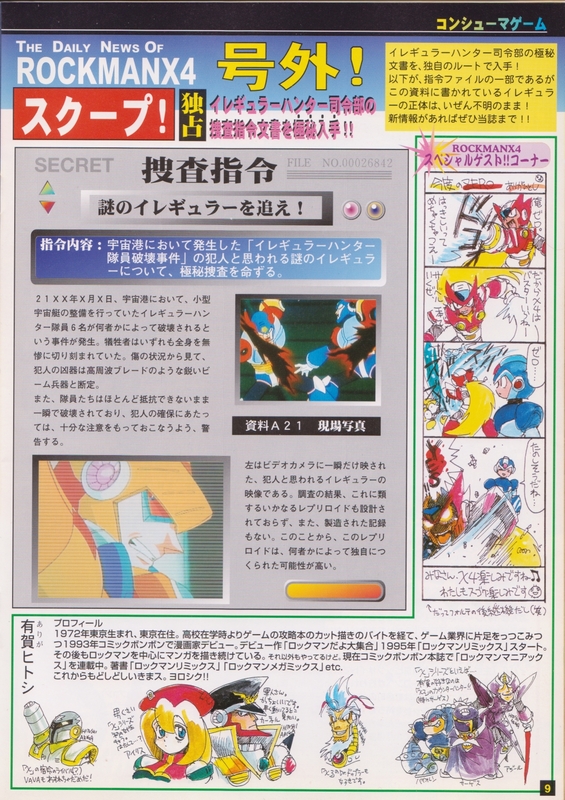 Hope you enjoyed the CFC’s special feature on Rockman X4 as much as I did. We’ll look at more CFC materials in the future! 6 Comments to "When Irregulars Attack"
Thats actually a pretty interesting take on why he stopped relying on the Z-Buster after X3. Though actually, my favorite explanation is the one on why he is having so much fun with slaughtering enemies. Yknow, Ive come to the realization- Your hard drive must be literally made of Rockman GOLD. A treasure trove of interesting and at times important tidbits and articles and such. My hard drive? Nah, I’d say most everything I have scanned is up on here already. I did have a lot of old gems saved in the past, but those drives are long gone. Even so, I still don’t back up files properly! I’ll probably never learn. Now, my book shelf… you’d probably like that! I probably would… I probably would. Hey, there’s nothing really graphic about this article. Oh, and the picture is obviously Double.